Printer manufacturers hope you will buy their printer at a low price and not worry about the cost of cartridges. Epson started to change that with its series of WorkForce printers that rely on liquid-fillable storage tanks at a price point of over $400. Brother has now taken that strategy by selling liquid-filled cartridges that are not refillable, but last one to two years. The result is their series of INKvestment multifunction printers than run $199.99 to $349.99 depending on how long you want the cartridges to last. Otherwise, both models have the same features but different ink levels. This review covers the Brother MFC-J995DW that includes one-year of ink in the box. Although list price is $199.99, discounts can be found as little as $170. When you factor in what you pay in ink cartridges over a year, this printer may seem like a bargain. This wireless printer does it all: print, scan copy and fax with your option of a document scanner or a flatbed. It does all of these tasks effortlessly. 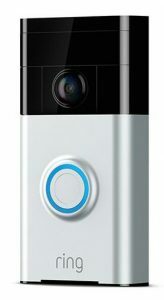 A few years ago, I received a Ring video doorbell as a Christmas gift. If you’re not familiar with one of these they are a great simple device that replaces the exterior doorbell on your house. Most exterior doorbells are really just a simple switch, but these devices include a wide-angle video camera, speaker and microphone for two-way conversation with anyone who rings the bell. I have the earlier version 1 which includes a 720p HD camera, but the newer models incorporate a 1080p camera for better resolution. The device couples with your home’s WiFi network, so that you can connect with it on your iPhone. In addition to iOS, Ring supplies application software for Android, Windows and Mac so there should be no problem with compatibility. In my case, the problem came with my regular WiFi signal not being sufficiently strong to work with the doorbell mounted on the outside of the house near the front door while my WiFi router is in my basement office. Fortunately, I had an old Linksys WRT160 router which I had replaced a few years ago with a Netgear WNDR4000. The Netgear was a significant improvement to the older Linksys which did not support the 5GHz speed. The doorbell only uses the 2.4GHz band so I created a separate network for the doorbell and the living room where the signal from the Netgear was weak. The WNDR4000 was fine with my computer located in the same room as the router, but my wife who has her computer on the third floor would often have poor connectivity on the 5GHz band and occasionally even on the 2.4GHz band. Neither router supported the newer 801.11ac protocol, but we rarely need to transfer large files between computers on different floors. Another drawback with this setup is it left us with 5 networks broadcasting their availability; two from the Netgear WNDR4000 (one for the 2.4 band and one for the 5GHz band), one from the Linksys, one from the Comcast cable modem and one for the xfinitywifi network which Comcast foists on all its subscribers for anyone to use when they visit your home. The main reason for not using the WiFi network on the cable modem is that the bandwidth is substantially inferior. Throughput with the cable modem network in barely 25% of what the bandwidth is when connecting through the Netgear router. Apple introduced a wireless keyboard with the numeric keypad over a year ago. Although it is a perfectly fine Mac keyboard, one has to question why one needs to pay $130 when there are other competitors out there. Logitech, for example, has offered a solar-powered full-size keyboard for $60. Another competitor is Macally that has been selling Mac keyboards for many years now. Its latest keyboard is the Macally Ultra Slim Wireless RF Keyboard for Mac(RFACEKEYA). It is priced at $69.99, but typically sells for $10 less than that. What makes this keyboard unique is that it has a full-size aluminum keyboard with a numeric keypad that uses a 2.4 GHz RF receiver dongle (like Logitech’s) instead of opting for Bluetooth. Anyone familiar with Bluetooth knows that this platform can be tricky and can often require re-pairing. The RF connection is more stable with fewer interruptions. If you’ve been looking for a keyboard that is comparable to Apple’s own devices, Logitech would seem to be a likely contender. Their keyboards offer Bluetooth® connections but also solar panels, illuminated keys and can control tablets and phones, just to name a few. Very few Mac owners would consider Macally keyboards, yet they, like Logitech, have kept up with technology. The latest example is the Macally Quick Switch Bluetooth® Keyboard(ACEBTKEY) that even tops Apple and Logitech’s keyboards. Although most of these keyboards feature specific media controls designed for Macs, they will work with PCs as well. This Macally keyboard does just that. Their “Quick Switch” feature refers to the ability to use Bluetooth® on many devices. In fact, this keyboard can handle up to 3 different devices including Macs, PCs, tablets (iPads) and smartphones (iOS and Android). In 2016 Apple introduced its Apple Magic Keyboard with Numeric Keypad. Previously if you wanted an Apple wireless keyboard, you would have received one with your iMac or you could purchase one for $99. The catch is that no number keypad was included. This just changed in June, 2017. Before this new Apple keyboard was introduced, both Matias and Kanex had released full wireless keyboards with a numeric keypad for less money. This review is an attempt to compare these three keyboards. All three are extended keyboards with numeric keypads and aluminum bodies. Color laser printers have left their mark giving users crisp printouts at faster speeds than ever. One of the newer examples is the Brother Digital Color Printer HL-3180CDW. This printer is designed for the home or office user that wants crisp laser printing at a lower cost per page than what inkjets offer. Although this laser printer is listed at $349.99, many retailers are selling it for around $300. If this price seems somewhat higher than similar color lasers, be aware that the HL-3180CDW includes a built in flatbed scanner. This color laser is designed for serious users. It is built like a tank and has a weight of nearly 48 pounds. Wireless Printing lets you print from your iPhone, Mac or PC, iPad or other mobile device directly to this printer. Built-in Scanner for scanning or copying documents. Multiple Connectivity lets you connect by Ethernet LAN, USB cable, USB flash drive or wireless. Recommended Monthly Volume: 300 to 1500 pages. Apple is known for its leading technology. This is evident with most of their products—except for keyboards and mice. If you’ve wanted an up-to-date keyboard, for example, you probably went with an aftermarket competitor. One such competitor is Matias that has just come out with a thin aluminum keyboard much like Apple’s standard keyboard—only better. Matias has been known primarily for keyboards with tactile key presses much like the earlier Apple keyboards of yesteryear. Matias still produces these keyboards—for around $150. Very pricey for a keyboard! This year, Matias has released its Wireless Aluminum Keyboard to fill the void that Apple has left. If you wanted an Apple keyboard with a numeric keypad, you had to settle for the Apple’s Wired Keyboard with Numeric Keypad for $49. The only Apple alternative would be its Magic Keyboard that is indeed wireless, but without the number keypad at a price of $99. If you follow Apple’s ads for the new Apple iPad Pro 9.7”, you would believe that this device is a dramatic improvement over recent iPads, but if you look closer, this is not necessarily the case. In September of last year Apple introduced the iPad Pro, a larger (12.9”) device with much of the specs of smaller iPad but with the introduction of the Apple Pencil for those who need to draw on their iPads. In late March, Apple introduced a smaller version of the iPad Pro (9.7”) to match the previous iPads in size, yet had newer features found only in the iPad Pro. Check out some of the new features. The iPad Pro picks up major speed improvements thanks to its Apple A9X chip with 64-bit architecture. This chip replaces last year’s A8X chip.. Apple claims this speed makes everything more responsive without sacrificing its 10 hours of battery life. I was not able to test the speed of the A9X, but those who did found a 200% improvement. From normal day-to-day activities you may not be able to find a significant difference, so speed bumps with this new iPad may be a perception issue.